When you talk about innovation in banking in Nigeria, one bank stands out. That bank is Guaranty Trust Bank PLC. 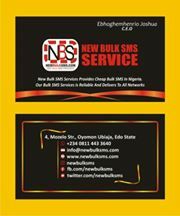 From services such as Internet Banking, the first Naira MasterCard, to Fastrack, GTConnect, Social Banking on Facebook, SME MarketHub; an e-commerce platform, to GTBank Mobile App, GTExpress, One Click Top-up and Bank *737# (banking without the internet), just to mention a few. The 737 banking services from Guarantee Trust Bank has introduced a whole range of possibilities never thought possible even from your torchlight phone. With the latest addition to the slew of already trending 737 banking services, the long cash withdrawal queues at the banking halls and the long queues at the ATM are about to be greatly reduced. 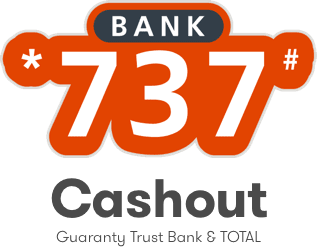 Guarantee Trust Bank (GTB) has partnered with the oil giant TOTAL which led to the roll out of the Bank 737 Cashout Service. This service enables you conveniently withdraw money from all participating TOTAL filling stations instantly. 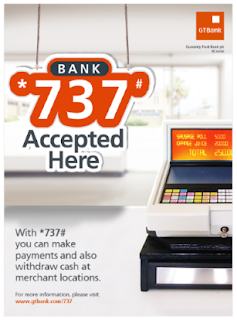 Say goodbye to long queues at the Atm, Trapped cards, Dispense errors, unable to dispense cash errors messages, out of service errors, etc when you make use of the Bank 737 Cashout Service. Awolowo 33 Awolowo Rd., Ikoyi, Lagos. Akoka 52, St. Finbarrs Road, Akoka, Lagos. Alapere 139/143 Demurin Street, Ketu, Lagos. Alausa Mobolaji Johnson Way, Alausa, Lagos. Give GTBank 737 Cashout Service a trial today and we will appreciate hearing about your experience. Enjoy the amazing features of 737 banking and remember to share this post with your friends and families. Knowing how to protect yourself from fraud is important. Fraudster uses clever schemes to defraud millions of people every year. They often combine new technology with old tricks to get people to send money or give out personal information. 1. Spot imposters. Scammers often pretend to be someone you trust, like a government official, a family member, a charity, or a company you do business with. Don't send money or give out personal information in response to an unexpected request — whether it comes as a text, a phone call, or an email. 2. Do online searches. Type a company or product name into your favorite search engine with words like "review," "complaint" or "scam." Or search for a phrase that describes your situation. " You can even search for phone numbers to see if other people have reported them as scams. 3. Don't believe your caller ID. Technology makes it easy for scammers to fake caller ID information, so the name and number you see aren't always real. 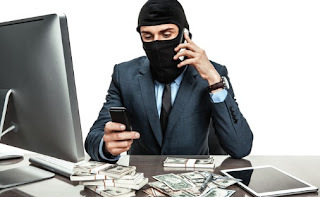 If someone calls asking for money or personal information, hang up. If you think the caller might be telling the truth, call back to a number you know is genuine. 4. Don't pay upfront for a promise. Someone might ask you to pay in advance for things like debt relief, credit and loan offers, mortgage assistance, or a job. They might even say you've won a prize, but first you have to pay taxes or fees. If you do, they will probably take the money and disappear. 5. Consider how you pay. Credit cards have significant fraud protection built in, but some payment methods don't. Wiring money through services like Western Union or MoneyGram is risky because it's nearly impossible to get your money back. Government offices and honest companies won't require you to use these payment methods. 6. Don't send money to someone you don't know. That includes an online merchant you've never heard of — or an online love interest who asks for money or favors. It's best to do business with sites you know and trust. If you buy items through an online auction, consider a payment option that provides protection, like a credit card. Don't send cash or use a wire transfer service. 7. Talk to someone. Before you give up your money or personal information, talk to someone you trust. Con artists want you to make decisions in a hurry. They might even threaten you. Slow down, check out the story, do an online search, consult an expert — or just tell a friend. 8. Hang up on robocalls. If you answer the phone and hear a recorded sales pitch, hang up. These calls are illegal, and often the products are bogus. Don't press 1 to speak to a person or to be taken off the list. That could lead to more calls. 9. Be skeptical about free trial offers. Some companies use free trials to sign you up for products and bill you every month until you cancel. Before you agree to a free trial, research the company and read the cancellation policy. And always review your monthly statements for charges you don't recognize. 10. Don't deposit a check and wire money back. By law, banks must make funds from deposited checks available within days, but uncovering a fake check can take weeks. If a check you deposit turns out to be a fake, you're responsible for repaying the bank. 12. Never Go to Your Bank's Website by Clicking on Links Included in Emails. Do not click on hyperlinks or links attached in the email, as it might direct you to a fraudulent website. 14. Enhance the Security of Your Computer. Common sense and good judgement are as vital as keeping your computer protected with a good antivirus to block this type of attack. There are always new online and phone scams, so stay informed and be cautious to avoid fraud. If you spot a scam, report it to Economic and Financial Crimes Commission (EFCC). Your reports help the EFCC and other law enforcement investigate scams and bring scammer to justice. 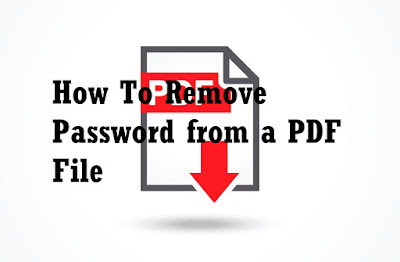 In this post, i will be showing you tricks on how to unlock a PDF document with password. Note: This trick will only work if the PDF doesn't have any printing restrictions. However, many PDF files are just password-protected to provide encryption and can be printed normally once you provide the password. Open the PDF document using your web browser and provide the password it requires. Click the "Print" button on the PDF toolbar while viewing the password-protected document. Click the "Change" button under Destination and select "Save as PDF". Click the "Save" button and you'll be prompted to provide a name and location for your new PDF. Your new PDF will contain the same content as the original PDF, but won't be password-protected. For example, open a protected PDF document in Microsoft Edge and provide the password to view it. Click the "Print" button on the PDF viewer toolbar after you have. Select the "Microsoft Print to PDF" printer and click "Print". You'll be prompted to choose a name and location for your new PDF file. You can do this trick in any PDF viewer on Windows 10. Just select the "Microsoft Print to PDF" printer. On older versions of Windows, you'll need to install a third-party PDF printer before you can perform this trick (or just use Chrome). Click the "PDF" menu button at the bottom of the print dialog and select "Save as PDF". Enter a file name and location for your new PDF file when prompted. The new PDF file will have the same contents as the original, but no password. You can also do this the official way with Adobe Acrobat Pro, a paid application. This is a different program from the free Adobe Acrobat Reader PDF viewer that most people have. Adobe offers a week-long free trial of Acrobat Pro. Adobe Acrobat Pro will work even if the PDF has printing restrictions, and can't be printed in other applications using the above trick. Open the PDF file in Adobe Acrobat Pro and provide its password to view it. Click the lock icon at the left side of the window and click "Permission Details". You can also click File > Properties and click the "Security" tab. Click the "Security Method" box, select "No Security", and click "OK" to remove the password. Click File > Save to save your changes. You can also just close the Adobe Acrobat Pro DC window and you'll be prompted to save your changes. Once you have, the password will be removed from the original PDF file. 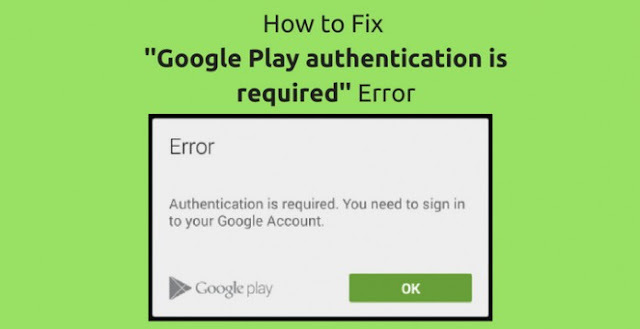 In this post, i will show you how to fix or solve "Google Play authentication is required" problem on Android devices. Remove your Google Account: Yep, you read that right. Most of the time the problem could be a simple sign-in which is caused by any recent updates to the Google Play Store app (it automatically get updated in the background). So, simply removing and re-adding your Google Account to from/to your phone has a good chance of fixing the issue. Go to Settings> Account> Google and tap the account which is causing the error. Then tap on the menu from top right corner and select 'Remove Account' and confirm to remove the account. To re-add your account, go to Setting > Account and select the 'Add account' from the bottom and proceed with the steps. Clear data from the Google Play Store: This is also one of the most effective solutions. This is almost logically similar to the above – instead of resetting your account, you are going to reset your Google Play Store. To clear Google Play Store data, go to Settings > Apps > Google Play Store > Storage and then tap on 'CLEAR DATA'. This is clear all the cached/stored data of the Google Play Store App. After doing this, try using the Google Play Store app by opening it normally. Uninstall Google Play Store updates: If just clearing the data doesn't work for you, do not worry, we have one more option. We can try uninstalling any updates to the Google Play Store. To do this, go to Settings > Apps > Google Play Store and tap on 'UNINSTALL UPDATES'. Doing this will reset you Google Play Store app to revert back to factory version which was there when you purchased your device. Now, you have to install the latest version of the Google Play Store. Make sure Settings> Security> Unknown Sources is enabled. Open the favorite file manager of your choice and navigate to the folder where you placed the downloaded file. Now you have the latest version of Google Play Store. Simply open the app, try using it and see if the problem is gone. Fresh sync: Go to Setting> Accounts> Google and select the account which is causing the issue. Tap on the menu icon on the top right corner and select 'Sync now'. Using browser: Go to Google Play Store website from any browser and sign in with your Google Account. Search for the app you want and hit 'Install' from there. If everything is fine, usually, the app will be automatically downloaded/installed on your phone. If none of the above work, then there is only one thing left to do. Completely resetting your phone to factory settings. It hardly ever comes to this point and the subject is out of the scope of this article. But unfortunately, if it does comes to this point, don't hesitate to drop a comment below. We will do what we can to get it resolved! Lot has been changed in Windows environment with the launch of Windows 10 operating system. It is considered as a most efficient version of Windows series. Despite the fact, Windows 10 is a most potent system to perform numerous tasks seamlessly there are certain tweaks you can perform its speed and performance. Let's discuss few tips in this article, to improve Windows 10 performance. 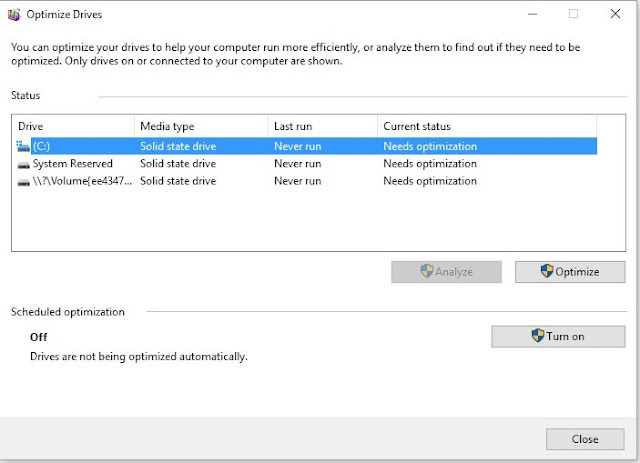 Adjust Virtual Memory Settings: Adjusting virtual memory settings in your Windows 10 system can help you improve system performance and prevent crashes when RAM is fully used. To adjust virtual memory in your system, go to Start menu > Settings > type Performance > select Adjust the appearance and performance of Windows. Now go to Advanced tab > Virtual memory and click on Change. Check what the Recommended value is and how it compares to Currently Allocated value. Enter the Recommended value in the Initial Size box and larger value in the Maximum Size box. Click OK to save the settings. Disable Visual Effects: Visual effects on your system consume lots of system resources and make your system performance slow. To disable unnecessary visual effects on your system, follow these steps. Press Windows + X keys and select System from the pop-up window. Under System window click on Advanced System Settings in the left pane. Under System Properties window select Settings for Performance. 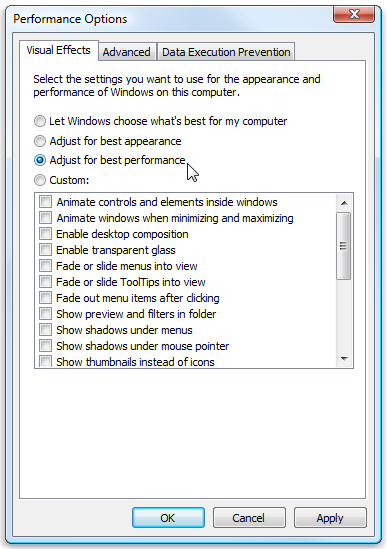 Now in the Performance Options window, click on "Adjust for best performance" to disable visual effects. You can also select "Custom" option to make tweaks as per your needs. Click on Apply and then OK to changes take place. Alternatively, you can select Control Panel > Ease of Access > Make the computer easier to see. Here uncheck the option called "Turn off all unnecessary animations (when possible) and click Apply. Manage Startup Programs: You can manage startup programs from Task Manager to smoothen your boot process. 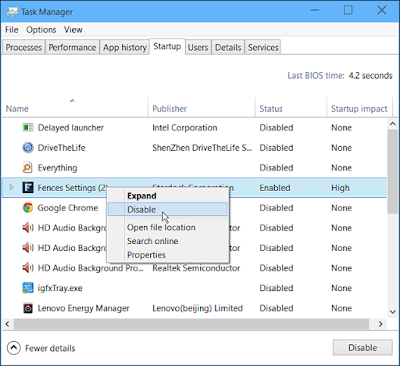 To access Task Manager right-click on the taskbar and select Task Manager. You can also left- click on the Start menu button to access Power User menu (Windows + X keys) and from the pop-up menu select Task manager. Here the Task Manager will open in compact mode, click on "More details" option to see the full view. Click on Startup tab to see the programs which run during boot time. To prevent any program from running at boot time, right-click on it and select Disable from the pop-up menu. Reboot your system for the changes to take place. Manage Windows Features: Windows 10 offers several "optional features" that can be turned off to improve system performance. Disabling certain optional features can help you avert security problems and other performance related issues. To turn off some of these less frequently used Windows features, go to Start menu > Control Panel > Programs > Programs and features and select "Turn Windows features on or off" option. 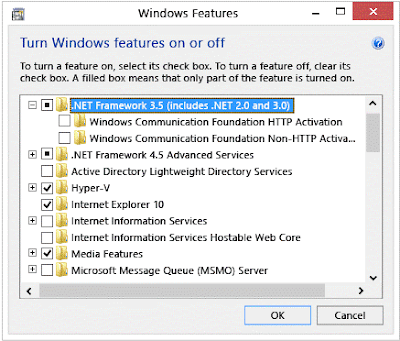 Here the list of all available Windows features will appear. Uncheck any of the features to disable it. Click OK and reboot your system. Clean Registry: Your system create registry with each new program installation and most of these registry files remain on your system even after the program is removed from the system. These unnecessary registry files accumulate on your system over time and start affecting your system performance negatively. To deal with it you can clean registry manually or use best registry cleaner for Windows 10 to fix your fragmented and cluttered registry instantly. Defrag Hard Drive: Defragmentation process on your system can help you improve system performance significantly. To do this, follow these steps. Go to Start menu > File Explorer and select the drive (Usually C) which contains Windows 10 operating system. Right-click on it and select Properties and go to Tools tab. Under Optimize and defragment drive section click on the Optimize button. It will open a new window called "Optimize Drives". Here ensure that the system drive (usually C) is selected. Now click on the Analyze button and wait until system completed the analysis and displays the percentage of fragmented files. Check the percentage of fragmented files in the results and click on Optimize button to start the defragmentation process on the selected drive. Let the process finish and reboot your system to see the difference. Apart from these simple tips, you can also consider following other steps as well to improve Windows 10 performance. These additional steps include updating all device drivers and software on your system, uninstalling unnecessary software and programs, hardware configuration, disk cleanup and many other options. Following these simple steps, you can boost up your Windows 10 speed and performance considerably. Summary: Following few simple tweaks and tips you can improve your Windows 10 performance significantly. Let's discuss some of these tips in this article to improve Windows 10 performance. Meet the latest BlackBerry smartphone called Aurora, its the first Blackberry smartphone with dual-SIM support. Blackberry Aurora smartphone has 5.5 inch screen size, On-cell display that carries support HD resolution of 720 x 1,280 pixels. 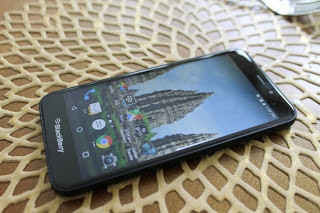 It is powered by Qualcomm Snapdragon 425 SoC, 4GB of RAM, 32GB of expandable storage via microSD card, full connectivity options (4G/LTE, WiFi, Bluetooth 4.2, GPS, A-GPS, micro USB). Blackberry Aurora has 13 MP main camera (Rear Camera) and with 8 MP front side camera. The dual SIM phone supports 4G LTE connectivity and it runs on Android 7.0 Nougat Operating System (OS) and it is preloaded with BlackBerry Hub. With DTEKTM preloaded on the phone, the BlackBerry Aurora offers the best security to protect its operating system and apps. The security application from Blackberry can tell the user whether the smartphones/device's camera or other components/functions on the smartphone is being secretly accessed by someone. With 3000mAh battery capacity. 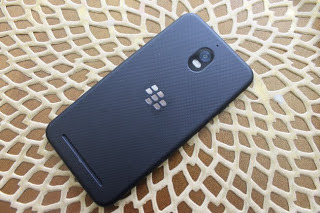 This Blackberry Aurora Smartphone/device goes for $262. it seems the smartphone/device will be targeted to Indonesian market. How To Retrieve All Your Recently Typed/Entered Commands in Command Prompt (CMD). In this post, i will be showing you many ways you can retrieve your previous entered command in command prompt which is popularly known as CMD. F8: Search your command history for a command matching the text on the current command line. So, if you wanted to search for a command that began with "p", you'd type "p" on the command line and then repeatedly tap F8 to cycle through commands in your history that begin with "p". F9: Recall a command from your command history by specifying its number in the history buffer. These numbers are display in the F7 overlay window, and begin at 0. So, if you wanted to quickly re-run the first command you ran in the current session, you'd press "F9", type "0", and press "Enter". The command would appear filled in at the prompt and you could press "Enter" once again to run it. F2: Copy part of the command you previously typed. You'll be prompted to enter a character. The system will search forward in the previous command you typed and automatically copy the text up to, but not including, that character. For example, if the last command you ran was "ping google.com", you could press "F2", type "o", press "Enter", and "ping g" would appear at the prompt. F3: Copy part of the command you previously typed. The system will start from the current character position and automatically copy the remainder of the text from that position on the previous line. For example, let's say the last command you typed was "ping -4 google.com". You could type "ping -6", press "F3″, and the system would automatically fill in " google.com", making the current line "ping -6 google.com". You won't be able to use the arrow keys, F7 key, or doskey /history command to see any commands you've typed after setting the list size to 0. This change also only takes effect for the current Command Prompt window, so the Command Prompt window will remember history as normal the next time you close and reopen it. Kaspersky Lab an antivirus (security) company recently has detected and dubbed a new disk wiper malware called "StoneDrill". This malware called "StoneDrill" is said to be Disk Wiper because it can erase everything on your hard disk. This malware "StoneDrill", as named by the security company Kaspersky, has code similar to that used in Shamoon, a plague that appeared in 2012 and deleted information from 35,000 computers from Saudi Aramco, Saudi Arabia's state-owned and the world's largest oil company. It is compiled in 32 and 64 bits and can be controlled remotely by the hackers. However, the most interesting thing about this severe malware is that it is less dependent on external servers than Shamoon to do the damage. 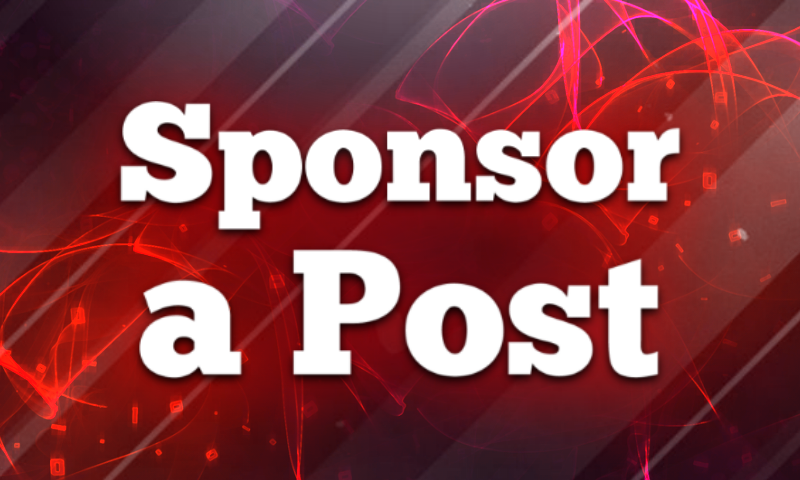 Now, many of you might be wondering that "How are the companies attacked by StoneDrill?" As Ars Technica shows, malware is smart enough to hide from antivirus and other security mechanisms: instead of using HD to install itself on the machine, as a common pest would do, it infiltrates the RAM region associated with User's browser and then it simply injects a module that cleans all the stored data. in this post, i will be showing you how you can enable or disable/block your USB ports in Windows Computer, maybe for security reasons. This trick might be essential for those who leave their computer/PC open for other people to get access to the computer/PC and with the help of USB they steal data without prior knowledge. If you want to secure your computer without your presence with which no one can steal your data, then follow the five ways below, so that you can block or disable all USB ports in your computer system/PC but, later on, you can again enable it for your use. Altering or changing registry values to disable USB Ports. By Uninstalling your USB Mass Storage Drivers. I would prefer this method for everyone because it helps users to do the process of enabling and disabling the USB ports in fast, effective way irrespective of other methods, if the administrator is quite smart, the register setting will save more time. Now you have just to find out START in the working area. In that, to Disable, Just Change the Value data with "4" or for Next time if you want to Enable your USB port again the Change it to "3" but remember after every task or changing the value Close your Registry Editor. The above method is the perfect way to disable USB ports on computers. However, if the above one failed, you can use another method of disabling the USB ports through the Device Manager. Then you will see a pop up with windows similar to the above image now at left select the Device Manager. Under Universal Serial Bus Controllers select all the device and with right click Disable all and see if it is working or not. If the port was not working, then restart your computer. Don't forget to enable that device later even after rebooting your computer. In schools, if administrators are worried about and concerned about more in security data breach purpose then the best way to disable the USB ports is by uninstalling of each and every USB drivers installed on your system. The uninstalling of MASS Storage Drivers is the extreme step taken only by the users who think that they for the next time will not be required to transfer data via USB ports eventually. However, Windows will search for USB port drivers and automatically it will install the drivers and you USB will again start working as usual. For disabling the USB ports on your computer after analyzing all the above steps and methods, if you are not satisfied then probably you need to install any third-party software on your computer so that it will block your computer's USB ports manually with a program software download it from here. The software can easily downloadable from the link here the USB Driver Disable / Enable, What you can do with the software? you can disable and enable your computer's USB ports. It is a free software which helps you lock any user defined folder and to block unauthorized access to USB device. In the Simple word it lets you block USB port and lock folders with password protection. This acts as a security tool. Let's know how to use it. Now you will see the screen like below. Now insert the USB drive on your Windows computer. Now you need to select the option "Flash Drive Lock" which is located just behind the Folder lock option. Now you need to click on Disable Flash drive to block the USB Port. If you want to enable it then just select the option "Enable Flash Drive" and enter your password. That's it! 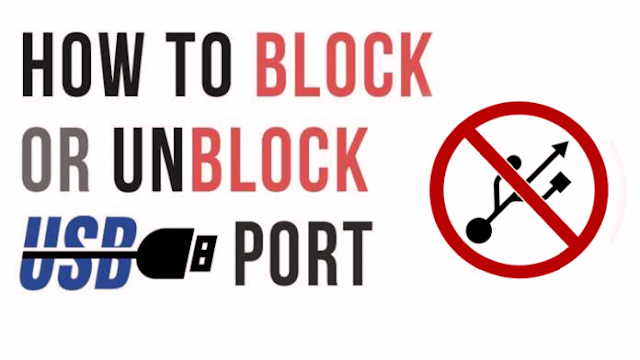 You are done this is the easiest way to block USB port on your Windows computer. Now if you have seen that the USB ports are not working even after you have replaced the previous settings such as Windows Registry Editor the now you probably needed Windows service support that is Microsoft Fix it 50061. Apply the setup, and it will fix your problems subsequently. Malware are all around us appearing or acting in different forms. For your computer/PC to be infected with malware you just need to be connected to the internet to be infected. Cyber criminals/Hackers never miss out on an opportunity to take advantage of the vulnerabilities within our computer systems/PCs. So, chances are high that your computer system might be malware-infected already. This is the most common form of malware, known as adware. 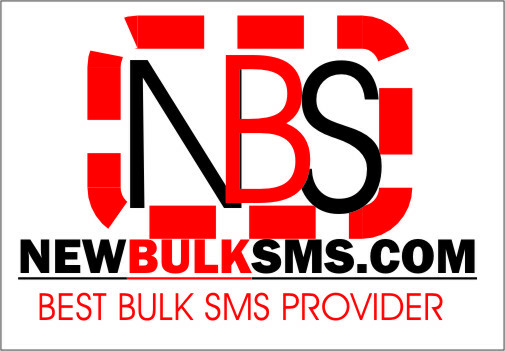 It pops up advertisements and various kinds of messages on a user's system. 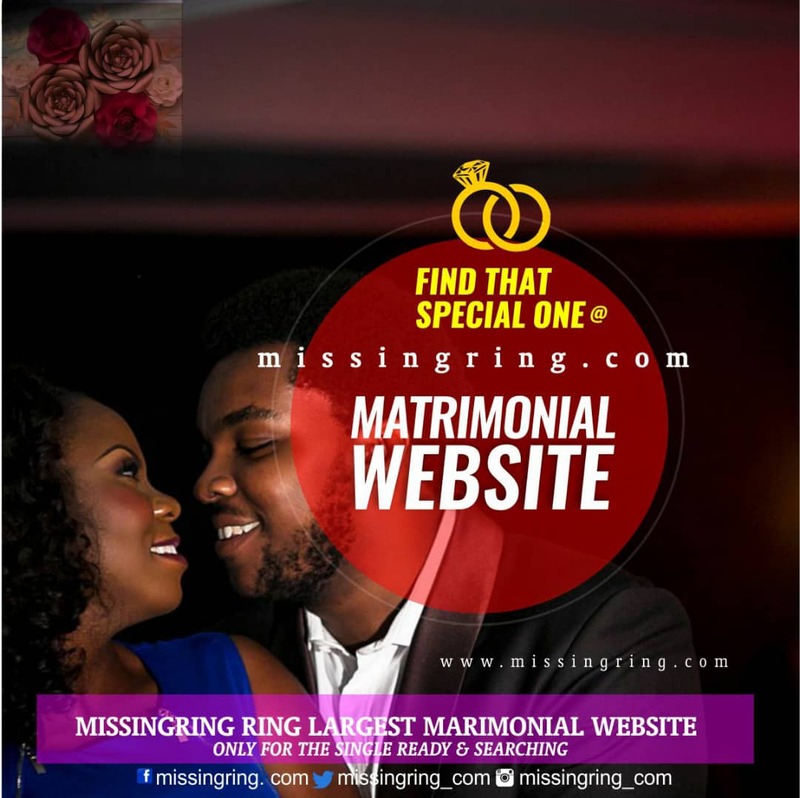 These ads are generally about discount offers, surveys, dating or lottery winning. Some ads may resort to scaring users. Either by telling users that there is a problem in their computer system or that their bank account information is expiring. These ads are not only annoying but also dangerous because they might have hidden spyware inside them. An infection might result in personal identity theft and financial loss. To get rid of adware or spyware, you should use effective anti-malware software like MalwareFox. If you have security software installed, its real-time protection might be disabled. In some cases, your system's update module may not seem to be working. Malware is developed by cunning minds that want to remove any obstacle that prevents running a malicious process on a user's computer. Antivirus programs can create a problem in the full functioning of malware programs and hence, it's often disabled automatically. This is an alarming situation that should be dealt with immediately. Advanced malware cannot be removed with traditional antivirus programs and that's why a full scan of your computer with anti-malware program is essential. Are you seeing new icons on your desktop? Any unknown programs starting up as soon as you boot up your computer? If yes, then it is probably a malware infection that was installed previously with some other software. They are known as Potentially Unwanted Programs (PUP Malware) that come bundled with freeware programs. Of course, that doesn't mean all free software programs are malware, but many developers use this kind of technique to make money. To avoid it, you must be careful when installing any programs and should not agree to any installations without reading the agreement first. Tools like Unchecky should be used to prevent unwanted program installation. Browser Hijacking is a form of malware which makes your web browser begin to act weird. Search engines might get redirected to pages that are combinations of fake sites and ads. Or your homepage might get changed without your consent. Or you might be forced to visit certain, random webpages. Programs like MalwareFox have a browser cleanup module that can remove this malware. Hackers can gain control of your social media or email accounts without even knowing your password. They sometimes just steal a cookie from an active user session and use it to authenticate a login to one of your accounts. Once compromised, accounts can be used to send spam messages to your contact list and spread malware to your friends' computers. To get ahold of the situation, you must log out of your online account from all devices. Then, set a strong new password that is difficult to guess. Use of 2-Factor Authentication and Password Manager is recommended in such cases. If computer boot up is taking longer than usual, it may be a symptom of rootkit, which gets embedded into your processor's memory. There might be slow down in the overall performance of your computing too. It happens because malware uses up available system resources leaving less space for other legitimate programs to operate normally. 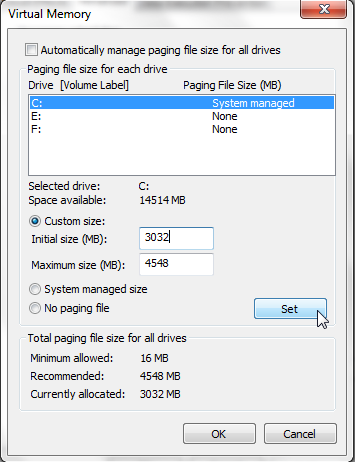 You should immediately check running processes in Task Manager of your Windows system. Look out for suspicious names in the list or run an anti-malware scan if nothing is found. Malware communicates with hackers either to transmit user data or receive information about a user's further activities. They generally use what's known as a Command and Control server for this purpose. Due to an increase in network activity, internet bandwidth gets utilized at a faster pace. You must monitor network activity, specifically the programs that are uploading data in the background. Programs like Glasswire for Windows and Little Snitch for Mac might come in handy. You must be well educated about cyber security to avoid such risks. 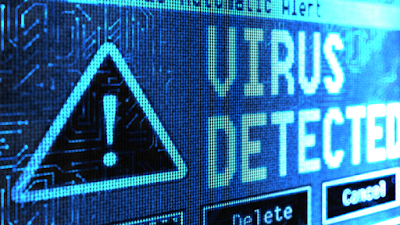 Knowing how malware works and spreads can help you stay safe. It is far easier to prevent a malware attack than you think. Make sure you act wisely while browsing internet. Never download files from untrusted sources / unknown email senders. Take immediate action to remove unwanted applications.